Meguiars Perfect Clarity Glass Cleaner delivers the crystal clear, streak-free shine you depend on for maximum visibility and a clean car. This unique formula helps keep glass cleaner longer, reducing the time and effort spent on glass care. Meguiars Perfect Clarity Glass Cleaner leaves no residue or streaks. Spray. Wipe. Done. 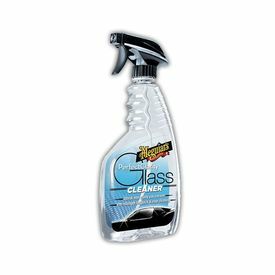 Meguiars Perfect Clarity Glass Cleaner features a new dust repellant technology. Clean glass less frequently! In addition, Meguiars Perfect Clarity Glass Cleaner contains a unique lubricant that creates an easy slide effect between the product and any cloth surface, ensuring that no residue is left behind. Instead, dirt is swept away and the transparent look of any glass surface is restored. Meguiars Perfect Clarity Glass Cleaner is a professional formula with no ammonia and it is safe on window tint and Sun films. To apply, simply spray Perfect Clarity directly onto glass, spread evenly, then flip the towel and buff dry. You can even use it direct sunlight! Meguiars Perfect Clarity Glass Cleaner lives up to its name!